Piedmont Middle School (PMS) is transforming the rural community of Piedmont, Alabama by reimagining the process of teaching and learning, transitioning to a mastery-based, personalized learning model. The school is already high-performing: it consistently meets AYP and the percentage of students who score "Advanced" on assessments consistently exceeds the state average. The Public Affairs Research Council of Alabama (PARCA) has recognized PMS as one of Alabama's highest performing middle schools. The teaching staff includes over 35% of National Board Certified Teachers. But a recent Gallup Student Poll reflects that students’ hope for their future, engagement, and well-being are low. The middle school’s redesign model, “mBolden Piedmont,” addresses two major issues in rural education: success in college and career and cultivation of non-cognitive skills such as grit and tenacity. The model has three main goals: advanced mastery, relevance, and student ownership. It builds on previous investments in infrastructure, devices, and digital content to create a blended, mastery-based learning approach. Students demonstrate advanced mastery of Alabama standards through hands-on projects, original creations, and experiments. Recognizing that career and learning opportunities in the immediate area are limited, the model increases students’ exposure to career choices, college paths, career immersion experiences, and global project-based learning opportunities. Mentor/advisor teachers help students discover their career interests and goals and then create learning opportunities relevant to students’ life goals, thus enabling students to see a real connection between their education and their futures. The flexible schedule includes Class Time, Goal Time, and My Time to allow for true individualized learning. My Time involves a self-directed flex block for autonomous learning. Through this kind of student ownership and choice, students develop the confidence they need to be successful in high school and beyond. 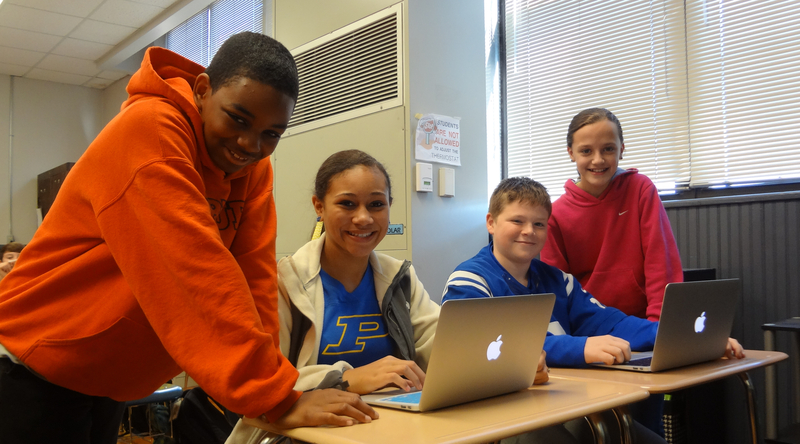 Through the district’s “MPower Piedmont” initiative, PMS students have access to laptops 24/7 with school-provided Internet access throughout the community. The district is investing heavily in professional development to build the capacity of school leadership, instructional coaches, and teachers to identify, interpret, and implement the significant pedagogical shifts the mBolden model requires. This includes blended learning, assessment for advanced mastery, interdisciplinary PBL, and data analysis. The redesigned model will be implemented in all grade levels and subject areas starting in fall 2014, but each subject-level teaching team is developing expertise in one of project-based learning, integrating digital content, and effective advisory time. They will take on another area of expertise, and eventually serves as the core group of trainers for scaling to the district’s elementary and high school grades. In a partnership with Jacksonville State University and a consortium of districts, content providers, and professional organizations called CoRE (Collaborative Regional Education), Piedmont is building a homegrown team of teachers who have the skills needed to teach in a tech-rich and personalized environment. Piedmont City Schools intends to become a national model of innovation for rural schools and districts.